It is prohibitions in New York City. Rival gangs of mobsters use their influence to bribe politicians, run casinos, bootleg liquor, and gain the favour of corrupt policemen. 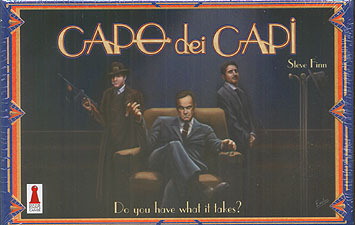 In Capo dei Capi, players compete to decide who will be the "Boss of all Bosses". Capo dei Capi is a "push your luck" area control game that is easy to learn, quick to lay, and contains a good amount of tactical decision-making. Also, a little luck can go a long way when you're a monster.